In this class we go deeper to release the inner core muscles and Fascia all over the body. This Fascia releasing also helps the Organs to relax and glide internally as they should. This helps the acupressure meridians come back into balance as well. The advanced muscle testing kinesiology is about what does this area need to heal? For how long? Then what does the body need to come back to whole health wellness and full potential? Is anything else needed? For how long? Using these methods many horses labelled ‘unfixable’ have come back to healthy sound happy lives. 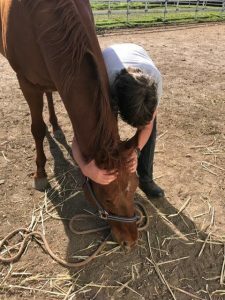 Cranial bones are addressed as well as the students receiving and giving a cranial unwinding session, to feel in their body what we are giving to the beloved Equines we work on. Many horses with Uveitis, Kissing Spine, Wobblers syndrome and String-halt have been helped in our 3 day workshops as well as private appointments. marisa@magichandshorseworks.com.au to inquire about private sessions. Contact Marisa for tariffs. Please register to indicate your interest to attend.